BOONE, N.C. – The Mountaineers had a vision and a purpose during the postseason, and it was met on Wednesday evening. Led by the starters scoring 75 of the 76 points and four players in double figures, the Mountaineers capped off a stellar season with a 76-59 WBI championship victory over North Texas in the Holmes Center. 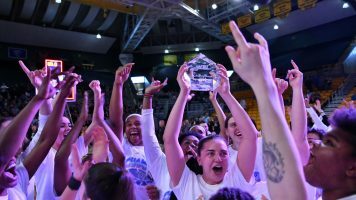 App State won its second WBI title in front of a record crowd, setting the Holmes Center mark of 1,823 fans for a women's basketball game. Ashley Polacek had her offense going with a game-high 21 points on 9-of-12 shooting and added four rebounds and four assists. Polacek did her damage in the second half, scoring 15 of her points in the third and fourth quarters. The WBI Tournament MVP, Pre Stanley, posted 19 points on the evening with seven field goals. Stanley finished the month on a torrid stretch, especially during the tournament where she averaged 19.3 points on 51.9 percent shooting from the field. Madi Story couldn't have finished her career off in a better way. The redshirt-senior finished her final game as a Mountaineer with a victory and a championship on her home floor. The senior staple put forth a 17-point performance, shot 7-of-11 from the field and pulled down five off the glass. Lainey Gosnell scored 10 points to round on the leading scorers on just seven shots. Bayley Plummer, who showcased a dominant performance down low, snagged a career-high 22 rebounds on top of eight points in the triumph. Plummer amassed three straight games with 20 or more rebounds in the three victories. Minus a slow start in the first quarter when North Texas captured a 22-15 lead, it was all App State. Appalachian outscored UNT in the final three quarters, 57-31, dominating both sides of the ball. After UNT shot 47.4 percent from the field including four 3-pointers, the App defense posed its will, limiting the visitors to just 12-of-46 shooting from the floor in the last three periods. Appalachian started to take over in the second quarter when it was trailing 29-24. The Mountaineers finished the second period on a 6-1 burst in the final 4:16 of the first half to tie up the contest, 32-32. Story scored the final six points of the frame to give the Black and Gold momentum. The Mountaineers started the quarter by scoring 12 of the first 16 points en route to a 44-36 advantage. From that point on, Appalachian ran away with the contest, converting on seven of its final eight field goals to go into the final frame with a 57-44 lead. North Texas never threatened in the final quarter, as the Black and Gold extended the lead to as much as 23 following a Polacek trifecta. App State sealed the victory and ended the season with a triumph, celebrating the postgame festivities with confetti and cutting down the nets. The Mountaineers tied for the highest win improvement in program history with a 14-win turnaround, secured 22 victories (most since 2011-12) and extended their Holmes Center record with 14 victories. Stanley was named the Most Outstanding Player, while Story and Plummer were named to the WBI All-Tournament Team.